Saturday morning, the competitors of the Mutually Assured Destruction of Omaha 24 Hours of LeMons race had just entered the track for transponder testing laps when this hunk of vintage Soviet iron came screaming by at low altitude. 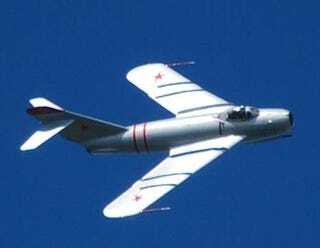 Turns out there was an air show going on at nearby Offutt Air Force Base, and the pilot of this plane— which appears to be a mid-1950s-vintage MIG-17F, also known as the Dodge Dart of Warsaw Pact Airpower— decided to give the folks at Mid-America Motorplex an example of Mikoyan-Gurevich-style hoonage. How about a few vertical afterburner climbs in a 55-year-old Russian airplane? First time I'd ever seen one of these things in person, and it definitely got the racing crowd in the right frame of mind to watch an epic Bobcat-versus-XJ6-versus-Metro battle on the race track.